A new OAN Board of Directors has been elected for the 2018–19 year, and began their term of office at the annual meeting held during the 2018 Convention event, October 27, 2018. This will be the first board to govern by the new representation-by-segment model, which members approved at the 2017 OAN Convention. Segment representatives include container growers Adam Farley of Countryside Nursery, Ron Kinney of Monrovia and Amanda Staehely of Columbia Nursery; field and bare root growers Jesse Nelson of Hans Nelson & Sons Nursery and Chris Robinson of Robinson Nursery; field and B&B grower Jay Sanders of KG Farms; greenhouse growers Ben Verhoeven of Peoria Gardens and Mark Leichty of Little Prince of Oregon Nursery; retailer Gary English of Landsystems Nursery; and associate member Tom Brewer of The HC Companies. Mike Hiller (Kraemer’s Nursery) was inaugurated as the next OAN president, receiving the gavel from now past president Josh Zielinski (Alpha Nursery Inc.). 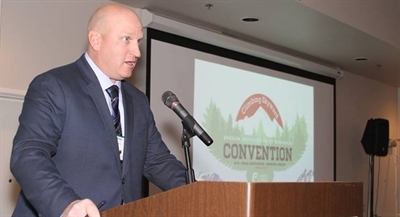 Joining them on the 2018–19 Executive Committee will be president-elect Jim Simnitt of Simnitt Nursery, vice president Josh Robinson of Robinson Nursery, secretary Denece Messenger of Decorative Bark Products, treasurer Kyle Fessler of St. Christopher Nursery LLC, and member at large Todd Nelson of Bountiful Farms Nursery Inc.